India is amongst the fastest growing large size economy in the world. Many believe that it has entered the early stages of a golden age that will span the next 25 years. It is the world’s second most populous country and a deeply complicated economy, with multiple forces of change taking place, not least driven by an active and forward looking Government. The Indian Banking, Financial Services and Insurance sectors (BFSI) sit at the centre of this perfect storm, and are at the crossroads of transforming this star performing emerging market into an advanced nation. Yet, the Indian BFSI sector is wrestling with multiple challenges that will test its ability to deliver shareholder value and wealth. Players that face the challenges head on could scale up world-class businesses. The BFSI INDIA 2018 Investor Forum & Corporate Access is the first time a large-scale forum and corporate access event is taking place in LONDON, the heart of the Transatlantic Financial World. Between Western Europe and Eastern United States, London is located in a sweet spot right in the middle of the world’s leading institutional investment community, managing trillions of dollars in investible funds. The event is designed to host >15 BFSI corporates and >150 institutional investors. Once in a while, a landmark conference comes along. It is timely, content rich, networking driven and highly relevant for its times. Most of all, it promises to deliver tremendous value to all participants – corporates, buy-side investors, sell-side brokers, and researchers. The event is designed to host >15 BFSI corporates and >150 institutional investors. The two day event is produced and promoted by Dickenson World, a company which is amongst India’s foremost Capital Markets Communication & Engagement specialists. With presence in London and Mumbai (and soon NY), Dickenson handles a variety of mandates of more than 95+ listed companies for their engagement with the financial marketplace and the financial media. For more information on Dickenson, visit our website (www.dickensonworld.com). Most importantly, IRcollective’s BFSI INDIA 2018 Investor Forum & Access is UN-CONFLICTED. It is organised by DICKENSON WORLD, one of India’s Leading Investor Relations firms, which is not an Investment Banker, nor a Brokerage House, nor a Research House. It is a pure-play investor relations consulting & execution firm, and as a result, the Forum is open to all Buy Sides, Sell Sides, & Research Houses, while the Corporate Access Day is open only to Corporates & Buy Side Institutions. 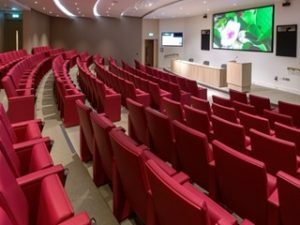 This Event will be hosted at the prestigious IET Venue at Savoy Place, London, at the Turing Auditorium. The Forum sessions will start at 9:00 AM and conclude before 6:00 PM. This will immediately be followed by evening cocktails at the IET Library. 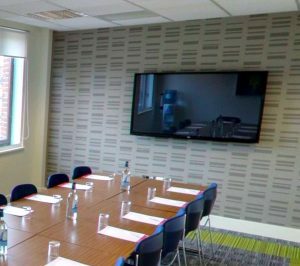 Each participating corporate will be assigned exclusive meeting areas within a single venue located at etc.venues, London Bridge – Prospero House. Investors participating will be required to pre-book their appointments with Dickenson for each corporate they wish to meet. The day will be broken up in 1 hour slots, and all meetings will structured as Small Group Meetings. Exclusive one-on-one meetings can also be structured on special request. The full programme and meeting schedules will be shared with all participants closer to the event’s date. Detailed Speakers List and Topics will Posted on the 10th October 2018. Dickenson reserves the right to alter the programme to match the availability of speakers and the final list of Corporates participating in this programme. Hear how Indian BFSI leaders and experts across the industry spectrum, are enabling their strategies, while countering the complex challenges faced in this fast transforming sector. Gain insights from thought leaders on what we can expect from the next phase of reform and technology disruptions to prepare your Investment strategies. Understand what Corporates think will drive their business value. Network with India’s BFSI C-level executives & IROs to gain strong insights to make more informed investment decisions. Hear how leading global FII’s and experts view the Indian BFSI sector, and what are the key drivers influencing their investment decisions. Network with your existing and new FII Investors from within UK, EU and USA, and engage with potential Investors already considering India’s BFSI sector as a target investment destination. Use BFSI INDIA 2018 (London) to be your annual ‘must attend’ corporate access day, and further energise your overall Investor Relations programme. The BFSI INDIA 2018 Investor Forum & Corporate Access is a world class event and is designed to attract very senior board level audiences. It will be attended by Indian BFSI CEOs, CFOs and IROs. It will also be attended by Investor Analysts and Investment Decision Makers of Funds in the UK, EU and USA. Discounts are available on group bookings. When booking 3 – 5 places save 10% per person, 6 – 9 places save 20% per person and for 10+ tickets save 30% per person. Discounts will automatically apply when booking. See terms and conditions with respect to cancellations. Dickenson is amongst India’s foremost Capital Markets Communication & Engagement specialists. With presence in London, New York and Mumbai, Dickenson handles a variety of mandates of more than 95+ listed companies for their engagement with the financial marketplace and the financial media. IRCollective is Dickenson’s Event Management Arm. 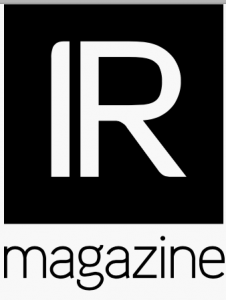 IR Magazine is a publication of IR Media Group, a business media company renowned for its magazines, websites, events and research. Originally launched in 1988 by the Economist Group, IR Magazine is renowned for providing quality insight and a global perspective. IR Media Group’s flagship publications, IR Magazine and Corporate Secretary, are essential reading for executives around the world. IR Magazine helps investor relations professionals globally achieve more in their IR programmes, benchmark their efforts and connect to their peers in the IR community. In addition to reporting the latest developments, writing in-depth features, producing research reports; and broadcasting podcasts; IR Magazine also hosts events around the world.